Love to shop? Shop for a homebound resident of Essex! Meals on Wheels is in need of volunteers to help with our Grocery Assistance Program in East Baltimore County. 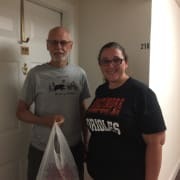 Volunteers are matched to a homebound individual in their area and work closely with their client to schedule shopping trips, prepare grocery lists, and help put groceries away. Volunteers don't take the client to the store, but they have a Meals on Wheels credit card and the client's shopping list to shop on their behalf. Each shopping trip averages 1-3 hours. The volunteer commitment for this program is a minimum of one year, and a strong sense of financial responsibility is required. If you're interested in this opportunity, please call 443-573-0933 or email jones@mowcm.org.